As UFC 127 ends with controversy, MMA fans are now anticipating the next match -- UFC 128: Shogun Rua vs Jon Jones. With UFC 127 ended to a draw, MMA fans and officials now switch their attention to the upcoming UFC 128 event. 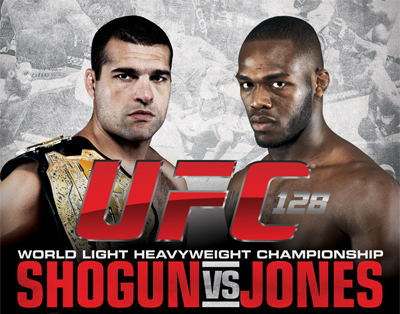 UFC 128 will highlight a light heavyweight title bout between Mauricio “Shogun” Rua and Jon Jones. The Shogun Rua vs Jon Jones match will take action on March 19, 2011 at the Prudential Center, in Newark, New Jersey. Check out the UFC 128 trailer and fight card below. * – Not officially announced.